The Alliance des Crus Bourgeois du Médoc’s upcoming vintage will rely once again on Advanced Track & Trace to guarantee the Crus Bourgeois du Médoc wines’ origin, authenticity and traceability, through the application of a highly-secured sticker. This partnership renewal highlights Advanced Track & Trace’s will to reinforce its services towards Bordeaux Châteaux and to accompany them in the valuation of their products in the world market. Having worked with the most prestigious brands for several years – Asia included – Advanced Track & Trace offers its expertise to its wine-and-spirit clients in the Bordeaux area. How many Crus Bourgeois du Médoc wines made the cut for the 2010 Official Selection? 260 Crus Bourgeois du Médoc wines were selected for the 2010 vintage. What are the criteria to select a Cru Bourgeois wine? There is one main criterion, and that is the obligation to reach one goal: the quality of the wine! What guarantees the quality of a Cru Bourgeois wine? For each vintage, every candidate is blind tested and if it qualifies, it is for a determined, registered number of cases. What are the reasons for the growing populari ty of the Cru Bourgeois appellation? – History: It is the oldest traditional classification in Bordeaux, which was used as quality recognition even before the earliest ranking methods. This is our lucky part, which makes the customers dreaming. – Quality: Each vintage of each wine is submitted to an organoleptic examination. This control reassures the customers, while creating emulation among the winegrowers. This quality is made possible thanks to our prestigious and world-renowned terroirs. – Pricing: Prices are reasonable for such a quality, and relatively stable from vintage to vintage, as they do not soar when one is outstanding. This translates in a range of well-positioned crus and a strong brand. To protect this position and this brand, all the bottles are now showing an authenticating sticker displaying the Cru Bourgeois logo. Why is a Cru Bourgeois sticker applied on the bottles? Our sticker clearly identifies the Crus Bourgeois du Médoc wines and guarantees that the quality of the wine in the bottle matches our standards. The consumer knows for sure that the wine deserves the Cru Bourgeois du Médoc selection. How can I check that my Cru Bourgeois du Médoc bottle is authentic? The anti-tampering sticker is applied on every bottle since the 2010 vintage. It guarantees the origin of the bottle. What are the other features of the Cru Bourgeois sticker? 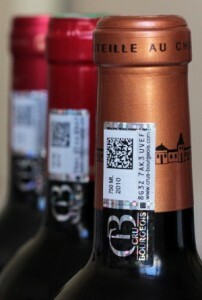 The QR code on the sticker redirects the wine lovers to our website. We can interact with the consumer, and deliver additional information on the Cru Bourgeois du Médoc Châteaux, more specifically on the services they offer around the wine tourism. Dit bericht is geplaatst in Nieuws met de tags Château Paveil de Luze, Crus Bourgeois, Crus Bourgeois du Médoc, FREDERIQUE DE LAMOTHE. Bookmark de permalink.